Tom Rogic smashed home a stoppage-time winner to hand Australia an undeserved 3-2 win over Syria and dump Fajer Ibrahim's men out of the Asian Cup in heart-breaking fashion. Omar Al Soma looked to have given Syria a point, and hope of qualification, when he won and then converted an 80th-minute penalty but Rogic had the final say with a stunning left-foot drive that flashed past Ibrahim Alma with virtually the last kick of the game. Earlier, Awer Mabil and Chris Ikonomidis twice put Australia ahead only for Omar Khrbin and Al Soma to cap a spirited Syria display with equalisers. Goal! Omar Al Soma tucks away the penalty! Game on! Goal! Chris Ikonomidis turns the ball in, it creeps just over the line! Goal! Omar Khribin pounces on a rebound and Syria are immediately level! Goal! Awer Mabil curls Australia into the lead with a superb strike! Team News! No Trent Salisbury for Australia he's suspended so Milos Degenek comes into the side. Fresh from scoring his first ever goal for his country Jamie Maclaren will be the dangerman in attack. As for Syria Mahmoud Al-Mawas starts on the wing, having struggled in the first two games Omar Al Soma has been handed the captain's armband and is in desperate need of a goal. Australia boss Graham Arnold has had his say before the game, remember the Socceroos just need a point to book a place in the round of sixteen. It's all about a winning mentality for the Aussie coach! "A winning mentality is all about that attitude and making sure we’re healthy, we’re fit and we’re ready to go. And we are. All that other stuff is just talk, it’s just noise. The only thing we’re focused on is three points and winning the game. We go into every match with the mentality of expecting to win the game and expecting our performances to increase in every game." Happy Birthday to Syrian attacker Omar Khbrin. A goal today and qualification to the round of sixteen would be quite the present for the 25-year-old. It's a sellout today in Al Ain, expect the Syrian fans to be out in force! 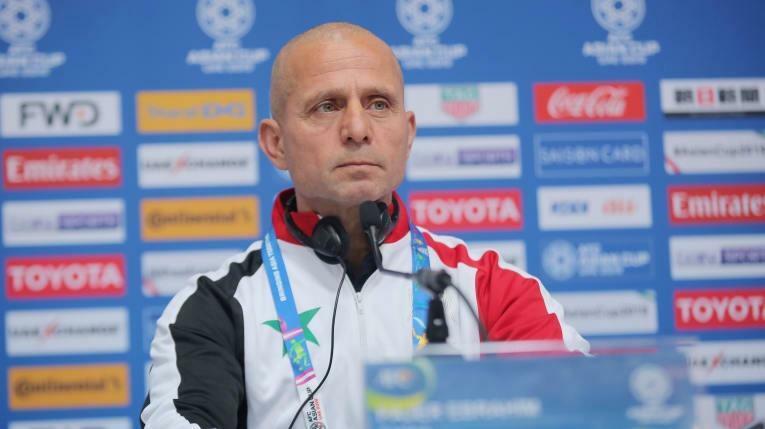 It's a huge day for Syria who parted ways with Bernd Stange following their 2-0 defeat to Jordan last time out. Fajr Ebrahim is now in charge of the West Asian side and will hope to galvanise the squad for this do or die match. Good afternoon! Welcome to the Live Updates of Australia Vs Syria at the Asian Cup. The Socceroos only need a point to book their place in the round of sixteen, whilst Syria will need a positive result and hope that they can finish in the top four as the best third-placed sides. Regardless, join me for all the latest updates, team news and Live Updates of the big match from Al Ain.